Line cookie sheet with foil or parchment paper. In 2-quart saucepan, melt 1 cup of the chocolate chips over low heat, stirring constantly; remove from heat. Stir in butter. Stir in whipping cream and liqueur. Refrigerate 10 to 15 minutes, stirring frequently, just until thick enough to hold a shape. Drop mixture by teaspoonfuls onto cookie sheet. Shape into balls. (If mixture is too sticky, refrigerate until firm enough to shape.) Freeze 30 minutes. In 1-quart saucepan, heat shortening and remaining 1 cup chocolate chips over low heat, stirring constantly, until chocolate is melted and mixture is smooth; remove from heat. Dip truffles, one at a time, into chocolate. Return to cookie sheet. Immediately sprinkle nuts and apricots over some of the truffles. Reheat chocolate dipping mixture, if necessary. Refrigerate truffles about 10 minutes or until coating is set. In 1-quart saucepan, heat baking bar over low heat, stirring constantly, until melted. Drizzle over some of the truffles. Refrigerate just until set. Store in airtight container in refrigerator. Remove truffles from refrigerator about 30 minutes before serving; serve at room temperature. 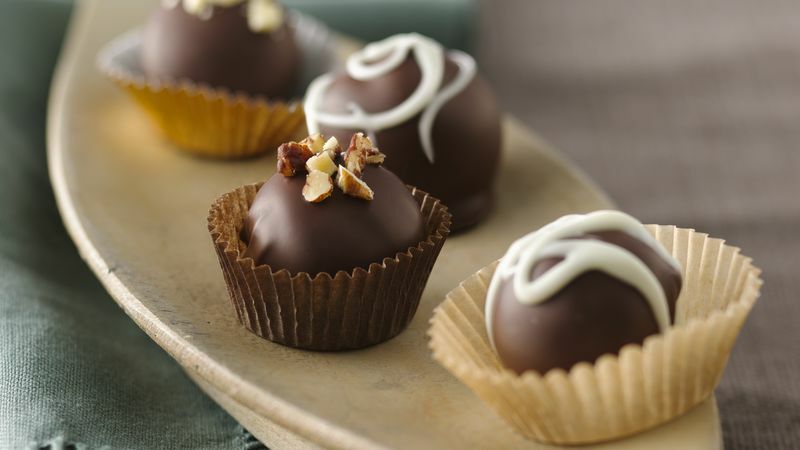 You can make these delightful truffles up to a week ahead--just take them out of the fridge about half an hour before serving for better flavor and texture. Milk chocolate chips can be substituted for the semisweet chocolate chips.